AN FINE & UNTOUCHED “ATTIC CONDITION” AMERICAN REVOLUTIONARY WAR MODEL 1766/8 CHARLEVILLE MUSKET & BAYONET, ca. 1770: In overall very good+/fine untouched/”Attic” original flintlock condition. The regulation length, 44 3/4″, band-fastened, round, smoothbore, .74 caliber barrel with top-mounted bayonet lug and a faint “D” Charleville Arsenal mark, on the top left side of the breech. The lock of standard configuration with a flat lockplate and its matching reinforced hammer and is marked with a barely visible “Charleville”, under the faceted iron powder-pan: also marked with a “D” (Charleville Arsenal marking), forward of the hammer. Finely molded and carved, Walnut fullstock with a deeply fluted raised comb, sharp contours, a fine untouched age-patina and a sharp/matching “D” Charleville Arsenal marking, on the left side of the buttstock. Retains fine untouched surfaces with richly oxidized and deeply patinated smooth wooden surfaces with some minor handling marks and expected signs of use. 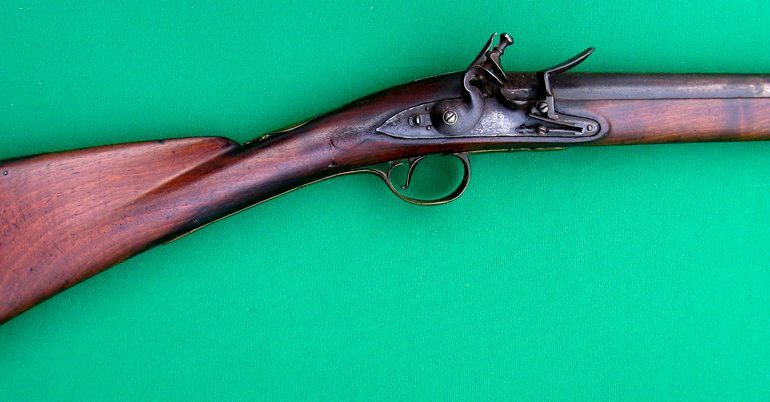 Model 1766/8 Charleville, full iron mounts: three (3) spring-retained barrel bands – the middle band with its forward sling-swivel and the rearmost with its 1768-73 spring “improvement”. 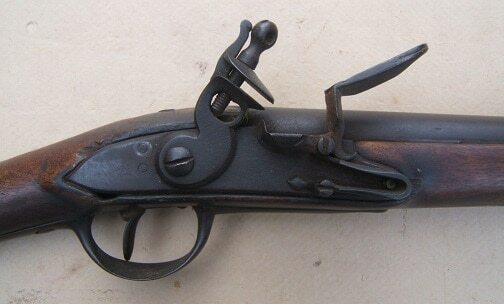 The trigger-guard with long teardrop finials: missing its sling-swivel-stud; a screw-fastened buttplate and a flat “S”-shaped sideplate. 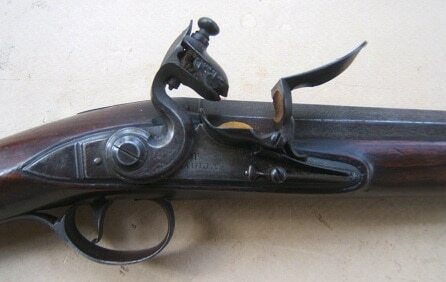 In overall very good+/fine untouched original flintlock condition with deeply toned, smooth, metal and wood surfaces. The barrel with untouched surfaces, a fine touch-hole and a dark age patina. Fine lock, en suite with its original components: strong mainspring & fine timing. The stock with 85% finish with nicely oxidized and patinated surfaces: the expected minor handling marks and signs of use/light wear. Untouched hardware with deeply toned gunmetal-gray/brown surfaces, en suite with the barrel and lock. A very nice example of a Revolutionary War Used Mdl. 1766/8 Charleville Musket. Complete with its iron button-head ramrod and its correct/original Model 1754/1763 French Bayonet. Overall length 59 5/8″. The Model 1754/1763 “Charleville” Bayonet, en suite with fine untouched, deeply toned, smooth surfaces. Of regulation Pattern with a tapered, triangular-form, 14 3/4″, flat, steel blade with a fluted bottom and a deep “French” type blood-groove, at its tip. The base of the blade with an illegible (French) Arsenal marking of classic Rev. War Period form. Open-type Mdl. 1754/1763 socket of regulation pattern with a “Z” shaped lug-slot for a top-mounted bayonet-lug: minor crack, at the slot. In very good+ near fine untouched condition with smooth, gunmetal-gray/brown, steel surfaces, matching those of the Musket. Overall length, 19 1/2″. A very nice and scarce American Revolutionary War Period Charleville Musket & Bayonet, ca. 1770. Of the type of assemblage most frequently supplied by France to aid the American Revolutionary cause. For additional examples and information, please see: M. L. Brown: “Firearms in Colonial America 1492-1792” pg. 185 & George Neumann’s: “Battle Weapons of the American Revolution”.